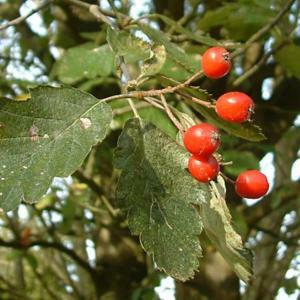 Small to medium sized tree with a dense rounded head. The lobed and toothed leaves are dark green above and greyish below. Dense corymbs of white flowers in spring. Large orange-red fruits are produced in bunches. Moist, well drained soil in sun or part shade. Tolerant of atmospheric pollution. Reaches about 6m. in 10 years.